underskriftsindsamling: Tell Congress to continue Jackie Robinson's commitment to level the playing field in education by providing more funding for underserved students. Tell Congress to continue Jackie Robinson's commitment to level the playing field in education by providing more funding for underserved students. A college degree has become increasingly important to succeed. Young adults with only a high school diploma too often live at or near the poverty line and face an uphill battle to change their circumstances. At the same time, higher education is becoming less attainable for low-income students. College tuition costs have skyrocketed: Today, the annual cost of college is almost double the yearly income of the average low-income family. The problem is especially acute for students of color. Graduation rates for Hispanic and African-American undergraduates are less than half that of their white peers, and most often cost is the culprit. Without the ability to get a college degree, young people of color miss out on opportunities to achieve economic success. 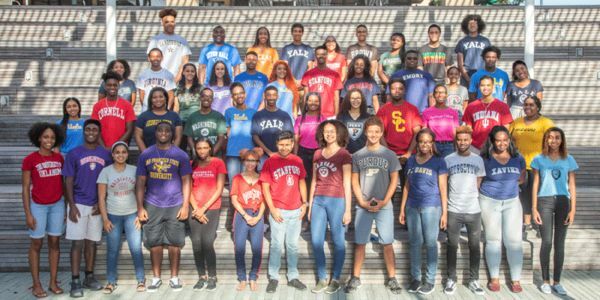 For 45 years, the Jackie Robinson Foundation (JRF) has stepped up to the plate to help close the achievement gap in higher education. It provides scholarships and comprehensive support to students of color with limited financial resources. With financial aid and services such as mentoring, internship placement and practical life skills and leadership training, JRF helps students succeed. Inspired by Jackie Robinson's groundbreaking legacy, the Foundation has helped thousands of students graduate at double the national average. As a nation, we cannot simply outsource equal education to the generosity of outside organizations. Ensuring equal access to higher education for all deserving students requires the coordinated effort of organizations like the Jackie Robinson Foundation AND the government, and we must advocate action. Tell Congress to support underserved students and allocate and more funding to close the achievement gap in higher education.